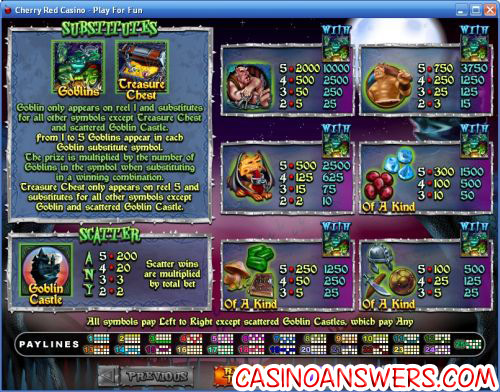 Goblins Treasure Video Slot Guide & Review - Casino Answers! Goblin’s Treasure is a 5-reel, 25-line video slot developed by Realtime Gaming, featuring two wild substitute symbols, scatter wins, multipliers, a free spins feature and two progressive jackpots. 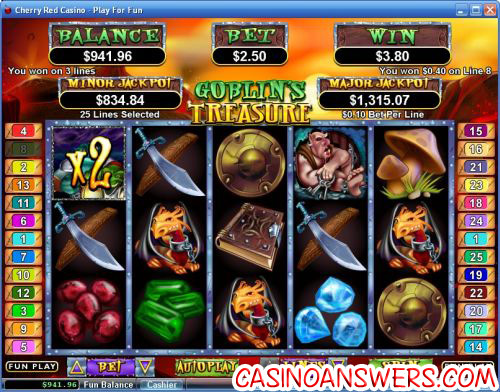 You can play the Goblin’s Treasure at USA-friendly casinos Lucky Red Casino and Slotastic Casino. Bets on the Goblin’s Treasure slot machine are $0.01, $0.02, $0.03, $0.04, $0.05, $0.06, $0.07, $0.08, $0.09, $0.10, $0.25, $0.50, $1, $2.50 and $5 per line. Goblin’s Treasure is a penny slot, so you can bet anywhere from one cent up to the highest total bet of $125. If you want to manually skill stop the reels, hit the “Stop” button. To play the Goblin’s Treasure video slot, hit the “Spin” button. Goblin’s Treasure has two wild symbols. The Goblins symbol is the first wild symbol, which appears only on the first reel and substitutes for all symbols except for the Treasure Chest and Scattered Goblin Castle. Between 1-5 goblins will appear on the symbol, which will determine your multiplier (5 goblins = 5X multiplier). The Treasure Chest is the other wild symbol, which is more of a traditional wild symbol. It only appears on the fifth reel and substitutes for all symbols except for the Goblins and Goblin Castle scatter symbol. When the Goblins symbol appears on reel 1 while the Treasure Chest symbol appears on the fifth reel, you will win 15 free spins with a multiplier of 1-5X determined by how many goblins appear on the Goblins symbol. If you re-trigger the free spins featue, 10 more free spins will be added to the current feature. Free spins are played at the lines and bet of the triggering spin. You can use the free spins feature to win big on the Goblin’s Treasure video slot at Lucky Red Casino! The Goblin Castle is the scatter symbol on the Goblin’s Treasure online slot. 2, 3, 4 or 5 Goblin Castle symbols anywhere on the reels will pay out 2X, 3X, 20X or 200X your total bet. Goblin’s Treasure has two progressive jackpots – Minor and Major Jackpot. The Minor Jackpot is at $900, while the Major Jackpot is at $1,400. Both jackpots are ready to be won. The jackpots are won randomly, thus no winning combination is required. The higher the bet you make on Goblin’s Treasure, the greater your chances will be of taking of these jackpots home. Hit the “Autoplay” button to open the autoplay settings on the Goblin’s Treasure slot game. You will be able to set the number of spins, set it to stop when the jackpot is won, stop if a win exceeds or equals (any amount you input), stop on any win, stop if your balance increases/decreases by any amount you input and stop once the feature is triggered. You can stop the autoplay mode on Goblin’s Treasure by using the “Stop Auto” button. To speed up the gameplay, simply hit the “Turbo Play” button in the autoplay settings. Goblins are scary creatures – big, green, loud and violent… but that doesn’t mean the Goblin’s Treasure video slot is scary! The Goblin’s Treasure casino game is not only a lot of fun, but also gives you lots of different ways to get some big slot machine wins while playing it. To try out the new Goblin’s Treasure video slot, you can sign up and make a deposit today at Lucky Red Casino! Are American players allowed to play Goblin’s Treasure for real money? Players from the United States are welcome to play Goblin’s Treasure and many other great slot games at both Lucky Red Casino and Slotastic Casino. For more details on Lucky Red, please read our Lucky Red Casino Review. Are there any other goblin-themed slot machines I can play at online casinos? Yes, you can read our Goblin’s Cave Multispin Slot Review or play it at Titan Casino. There is also a Goblins Gold slot machine that you can play at Gaming Club Casino. For more details on Gaming Club, you can read our Gaming Club Casino Review. Is there a Flash game of the Goblin’s Treasure video slot anywhere? RTG Instant Play casinos only have a limited selection of video slots and other casino games available in their Instant Play no-download casinos. At the time of this writing, Goblin’s Treasure is not one of the video slots currently offered. Where to play the goblin flash game?